I mentioned to Pam that I wanted to try to make it to the Florida Masters week in February. Her knee jerk response was ‘then you better buy that new sail now and start using it and not waste the opportunity.’ Oh, the joys of being married to a sailor. Even a self-described ‘batshit crazy, menopausal’ wife seems to remain a sailor first and a wife second. Or maybe I just got lucky. So, before spending the money, I decided to check with Brett Beyer and get his opinion on the break in time and competitive life of the sail. His reply surprised me. He bought a new Aussie boat and it came with the new sail, and he is currently on the fence about using it in Mexico. Doug: From your experience, how long does it take to break in and how many regattas do you think that it will remain competitive? I noticed that the MK II is being made by both North and Hyde. Do you have a preference? Brett: Most don’t realise that, at this point in time, there is a third manufacturer. Neil Pryde made in China. The Pryde sail is the only one we have access to in Australia. Time will tell if there is any difference. I have a new sail supplied with my new boat … I am having second thoughts about which sail to bring over [to Mexico]. I have seen the MK II sail in a breeze and don’t think it is as good as the original. Up to around 15 knots it is an easy decision, but over that, I am not convinced as yet. For sure there are some variations in set-up with the new sail and we’ll have to get used to that in the future. 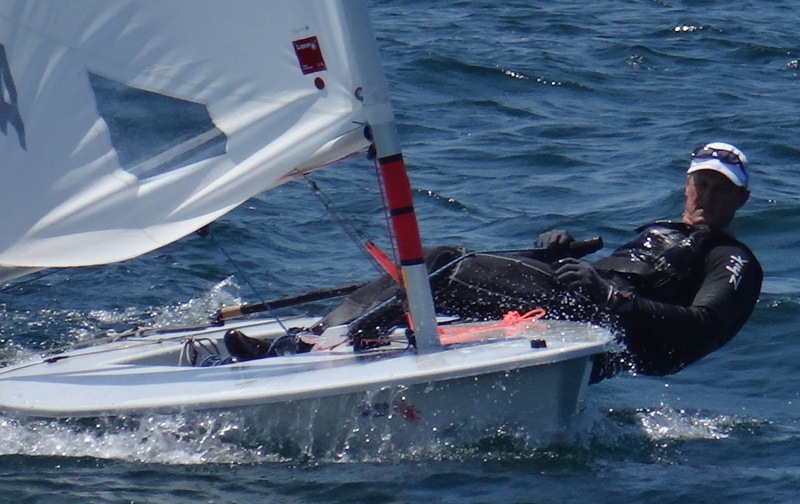 We have our Aussie National Masters in February and I plan to compete myself and use the new sail. I will decide on which sail to take to Mexico based on that regatta. … I see the new sail as being pretty good straight out of the bag. The cloth is heavier and the shape better so not much push and shove required for the sail. At the top level, we were upgrading [the original] sails about every 30 sessions, maybe less if it those outings were generally windy. I can only imagine the new sail to have better life with the upgraded cloth quality and thickness. Doug: … [Do] you mean that over 15 knots the original sail may be better? I would have expected the opposite. So if Mexico is under 15 knots you'll probably use the MK II, and over 15 knots (which many expect) you're still undecided? Brett: Yes old sail may be better over 15 knots. The Cunningham doesn’t work on new sail as effectively so the concern is how to reduce power on new sail. Vang on and ease/play sheet seems to be only option and this adds another dimension to upwind. Whilst I'm quite happy to play the sheet to balance power, I know many Masters will not/cannot. Doug: … why is the MK II better under 15 knots? Brett: The new sail has straighter and firmer leech and better shape at top 1/3rd of the sail. This produces more power, and theoretically, more speed. But only if you can manage that power. With good technique.....good fitness......or enough lard, it seems you can manage this extra power up to around 15 knots. Thanks for sharing. Very interesting yet also slightly unnerving as I thought I had made up my mind using the new sail in Mexico. Having sailed the MkII most of last season on a lake with generally light winds and sometimes a few races in breezier conditions I would also add that the old sail seems to have a slight advantage in very light conditions but from 5 knots and up the new one seems faster. What are your thoughts now after having heard what Brett had to say? Hmmmm, this makes it interesting. My strength is medium conditions and my weakness is stronger conditions. It's human nature to practice what we're good at but the Law of Diminishing Returns minimizes improvements. So I'll probably stay with the older design and sacrifice speed below 15k to improve speed above 15k. But we all have several more months to decide. I'm concerned that it's against the pure one design spirit of the Laser rules to be choosing between the two sails based on what offers better performance. Not judging, if I was going to Mexico I'd be doing the same thing. I'm just not sure it's the best thing for the class. The Mark V Radial (or was it the Mark IV) was known to be fast, and a few people stockpiled them and used them to great effect at Open and Masters Worlds for quite a few years afterward. Hopefully that doesn't happen with the new full rig sail, but if the old sail is known to be faster in some conditions, I bet a few with deep pockets will do it. Maybe we need a class rule forbidding the old sail at major regattas after a grace period of a year or two. What do you think? In the 60's, I sailed OK Dinghies and those who could afford it had different masts for different conditions. If you guessed right, you did well but if you did not you were hosed for the racing that day. The worst situation was having a heavy-air mast when the wind died… you could not point and went sideways. Having to select a sail for a particular event introduces problems that the Laser's strict one-design was supposed to eliminate. Also, the top sailors have had a preference between the old North and Hyde sails. I wonder if we'll learn that the three MK II sails also have their strength and weaknesses. And when the new top sections are available, we'll have ten different combinations to understand, learn to use, and compete with. The Laser's one-design concept may be at risk. We just finished our NZ Laser nationals and I thought I would offer the following observations. Approximately half the Masters Standard fleet used the new MkII sail and the balance the old sail. We had 8 races in 15 to 30 knots. My conclusions from the results is that there is no significant performance difference in those conditions between the old and new sail. The results depended on the sailor and how they sailed rather than which sail they used, just as it should be. New sails placed 1,3,4,6 and 9 in the top 10. Old sails 2,5,7,8 and 10. The sailors using the new sail were very positive about the look, feel and performance right up to the 30 knots we had at times in the last race. My conclusion is that the new sail will be more durable but perform very closely to the old sail as was the aim of the change and that the class is onto a winner with the MkII sail. Very good to hear, thanks for your update. I'm soon off to the Masters Week in Florida and will also pass along whatever I learn.